All my life I learned to live with pain, to mine it. I produced six books holding on until it’s ripe, ready to burst, then putting a faucet on it, a carefully controlled faucet called poetry. But my last book used it up, the last held drop. I could have surgery, but she assumes, correctly, that I’m not ready for that. However, for the knee there is something you can do. Something you can put over it and strap to your thigh and foreleg. What does it feel like, the nurse asks. “Like an alligator strapped to my leg with my knee in its mouth.” Well, that must be the wrong brace, she says. Let me look at those x-rays again. But this is the good news: I’ve worn out the past. Now I get to begin a new life. One in which, day by day, moment by moment, I make adjustments, I take care of the present, I live it as it is now. Last night, a beautiful and expensive dinner with a dear friend. We hadn’t had time to sit and talk for months. It was exciting, some parts fearful as we stretched to talk about the changes, the good changes, the way her shoulders are less squared after months of yoga. Now she is being Rolfed, something I hadn’t heard about since that essay in the New York Times Magazine (was it in the ’70s?) that exposed the way people spend thousands of dollars—the price of a house! —being bruised in the name of accessing bad memories stored in the muscles. The therapist presses until the memory surfaces like a giant inside you crying uncle. But, truly, when she walked up to our table she looked beautiful—sixty-four and she looks forty—and when she told the story about how her shoulders were released by doing yoga—she had had to always be on guard, ready for violence—I could see that was where the beauty came from. A relaxation had opened up her throat so that something like happiness was able to come up, a light that must have been trapped in her chest. She looked beautiful, not because she had added something but because she had taken something away that had been holding her back. Now she looked like herself. So I understood we’re all supposed to be beautiful. It’s too bad that we have to work for it, because that is the way we were born. The new peaches are in at the farmstand. I came home loaded with a bag of local ones; a couple of crisp, shiny peppers mirror-smooth except for a little brushed dirt; a blackish eggplant shaped like the heavy bosom of a nursing mom; tomatoes whose skins are tight as in the last trimester; and four white and two purple onions (he threw in two extra)—“sweeter than Vidalia, just you wait until you taste them!”—so shiny they looked oiled. At 3:30 a.m. the insomniac, aroused as usual, is even more aroused by the thought of that array of bright colors and fragrances casually rolled out of the cloth bag on the counter near the sink. I am drawn to them, want to touch them, wake them up, like me, and put them to work. Down I go, remembering to turn off the alarm so that I don’t scare myself to death, and until 4:47 I am chopping, rinsing, stirring so that they don’t burn; and the best part is, when I step out in my bare feet in the dark to load a bowlful of basil and parsley growing right at my front door, I see the wetness soaked into the cement walkway, and when I flick the porch light on, I see the shining tears on the leaves of the basil. I’ve stepped into the right moment when the sprinkling system, installed just a few days ago, turns on. I’ve been wondering what time this happens when I come out in the morning to that rained-on dampness. I’ve stepped into the sage growing rampant, the parsley like green feathers on a cocktail hat, the basil up to my knees and thick as a hug: another grove of manifestations of my learning to love myself. All this I have made for myself—a little 6-by-6 paradise blazing with fragrance. I zip off a couple of handfuls of parsley and fill a quart-sized bowl full of basil leaves the size of my palm. I’ve worked all of my life in order to take care of myself in my old age. I don’t mean like rich people. Just to have some of the things important to me. I like a fit body. And I’m prone to being a bit overweight. Though I’m fairly disciplined about getting to the gym three times a week, it all falls apart when I’m teaching and traveling, and that happens a lot. At this age, I have to have what I need in easy access. As I plop down the enormous bucks for the elliptical, I have to convince myself I’m worth it. I was working with my young assistant today, laughing and complaining about my over-the-top commitments, and she said, also laughing, that’s the price you pay for ambition. And it stays in my mind, that these long hours each day and through the night, for all these years, consistently performing my tasks, going down my list of commitments, responding in the most efficacious way to letters, requests, e-mails, phone calls, writing recommendations, reviews, evaluations, calling people, even for the friendliest reason, putting myself in the position to be visible, has been excruciating. I who have spent my life not only responding but, first, before responding, double-checking myself again to make sure everything is spelled right, everything sounds intelligent, everything does not reek of my stupidity or anger or want. I who have so carefully phrased my want, so terrified that a ragged longing might make itself evident. It struck me hard when I was nineteen and four months pregnant that it was up to me to take care of myself. My lover was intelligent, flattering, nonjudgmental (my favorite part! ), charming, and an artist accustomed to living pretty low on the hog. He was an alcoholic. He couldn’t keep a job. He liked other women. I, who wouldn’t have had the vaguest idea to move out of the house of my abusive parents, found myself pregnant and on my own. My parents didn’t kick me out. I decided I’d rather leave than to tell them, rather than to show that face of need. I couldn’t bear their pity, sadness, disappointment, or rage. I remember certain times in my life when my mind actually changed. Something flipped, like a flipchart, and I was in another world. It happened like that when I decided my husband had to go. My son was two. I had been suicidal for months, holding myself back moment by moment from jumping out of our fourteenth-floor project window. One morning I woke up, looked over at him sleeping in the other twin bed—the teen bed I had brought from my mother’s house—and I thought, yup, this is it. I got up, dressed to go out to my day job (I was substitute teaching at that time), came back into the bedroom, and touched his shoulder: “I’m leaving for work. When I come home, I want you to be out of here.” I guess he thought that, as in the past, such threats indicated we were going to have another big fight. But inside me was a new me. You can’t make it happen. Slowly, sunup by sunup, new moon by new moon, something changed. Once I asked my mother how you know it’s time for a divorce, and she said nobody can tell you. But when it’s time you know. Maybe there was a second in which my mind thought in a different way, like using a muscle you never used before and not even knowing you’re using it because you never felt what it was like and don’t know the difference between that muscle and all the others around it, as if all your thinking had been a blob of self-hate and, in an instant, without you even trying or knowing it, the self-hate moved out of the way. I can remember clearly when it happened, for there was actually a night when I was going to kill myself and I didn’t. A neighbor, who had no idea of what I was going through, for some reason knocked on my door with a bowl of popcorn and said, I’m going to watch TV; you just go to sleep and rest. But where are your kids, I asked. Don’t worry, she said, I have a babysitter. Just go and rest. It’s true I had been physically ill. Shortly before I had spent a week in the hospital with what they thought was a blood clot in my leg. But I’ll never know what made her show up at that moment at my door. And that night, when I lay back in my twin bed, I felt myself go out of my body. I thought I was going crazy, which is what I had feared for months. But something in me said, just let yourself go, this feels better than anything you’ve felt for years. That night flying around, as if I were flying around the world, around the universe, and looking down at my husband when he came home, I stepped out of pain. Day after day I got better, and six months later I woke up and knew. Like a wound that I’d made in my own body, a wound to try to love, which I found out later I had to close up, because, as it turns out, wounding yourself is not the way to love. Underneath there was another mind, a mind completely hidden at the time, a mind that, in some way, dragged the body and will behind it. It was a cold mind, a clear mind, it was a mind that suddenly knew when to close a door, a mind that said no and meant it, a mind that couldn’t be bargained with. It was a final mind. It was a mind at the base of a clear instinct, and though I might not have noticed it at the time, it had a partner, maybe like one of those twin suns spinning at the center of some galaxies, sometimes this one in front, sometimes that; it was a deep voice of rage, of anger, and it said: Don’t die. But there was something that happened right before the switch in my brain, something that got buried, as if it disappeared in a crease of skin, like the universe folding up on itself and several galaxies disappearing inside—a stillness and a deep hole, something that went through the heart like light or darkness, something eternal, real, and human that flinches inside us, that trembles in our eyesight, that is too delicate or that hurts too much, something that I forget or forgot; yet something not because of anyone or anything else, something in me that didn’t form as a result. It happened at the moment when I turned aside the most human pain, when I couldn’t find a way out of a conversation with the world and into a conversation with myself. It was something so easy to see and understand, something so first and primal, and it was just a moment, the first and most minimal turning, and a question, a little question that never got asked. 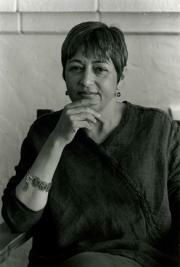 Toi Derricotte has published five collections of poetry, most recently The Undertaker's Daughter (2011). An earlier collection of poems, Tender, won the 1998 Paterson Poetry Prize. Her literary memoir, The Black Notebooks, published by W.W. Norton in 1997, won the 1998 Anisfield-Wolf Book Award for Non-Fiction and was a New York Times Notable Book of the Year.